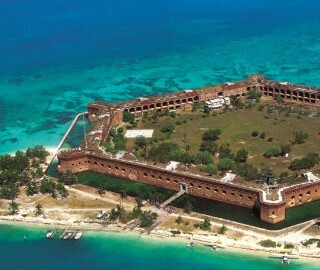 Almost 70 miles (112.9 km) west of Key West lies a cluster of seven islands, composed of coral reefs and sand, called the Dry Tortugas. 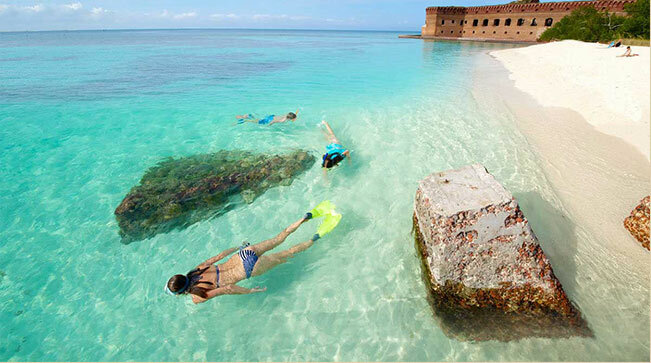 Along with the surrounding shoals and waters, they make up Dry Tortugas National Park. The area is known for its famous bird and marine life, its legends of pirates and sunken gold, and its military past. The freshwaters of the Big Cypress Swamp, essential to the health of the neighboring Everglades, support the rich marine estuaries along Florida's southwest coast. Protecting over 720,000 acres of this vast swamp, Big Cypress National Preserve contains a mixture of tropical and temperate plant communities that are home to a diversity of wildlife, including the elusive Florida Panther. Situated on a barrier island along Florida's east coast, inviting park highlights include pristine, undeveloped beach, dunes and lagoon offering sanctuary to an abundant blend of plants and animals. Year-round recreation includes fishing, boating, canoeing, surfing, sunbathing, swimming, hiking, camping, nature and historical trails. A monument not only of stone and mortar but of human determination and endurance, the Castillo de San Marcos symbolizes the clash between cultures which ultimately resulted in our uniquely unified nation. Still resonant with the struggles of an earlier time, these original walls provide tangible evidence of America's grim but remarkable history. On a swelteringly hot day in May 1539, Spaniard Hernando de Soto splashed ashore at Tampa Bay intent on capturing the riches of La Florida by any means necessary. His army was alternately welcomed and opposed by Native American tribes throughout what is now the Southeastern United States in a four year, four thousand mile odyssey of intrigue, warfare, disease, and discovery. Everglades National Park is the largest subtropical wilderness in the United States. The area boasts rare and endangered species, such as the American crocodile, Florida panther, and West Indian manatee. It has been designated an International Biosphere Reserve, a World Heritage Site, and a Wetland of International Importance, in recognition of its significance to all the people of the world. Ft Matanzas stands stark against the low landscape of the Matanzas River Coastal Florida was a major field of conflict as European nations fought for control in the New World. As part of this struggle, Fort Matanzas guarded St. Augustine's southern river approach. The colonial wars are over, but the monument is still protecting—not just the historic fort, but also the wild barrier island and the plants and animals who survive there amidst a sea of modern development. Island beaches, sparkling waters, bayous, historic forts and recreational opportunities are plentiful in Gulf Islands National Seashore, the nation's largest. Open year-round, the Seashore is in Mississippi and Florida. Gentle breezes, tides and hurricanes constantly reshape this dynamic landscape. Visit one of the last unspoiled coastal wetlands on the Atlantic Coast. Discover 6,000 years of human history and experience the beauty of salt marshes, coastal dunes, and hardwood hammocks.